Gallia Academy senior Cory Call (22) drives to the basket, during the Division II sectional final on Feb. 23 in Londonderry, Ohio. 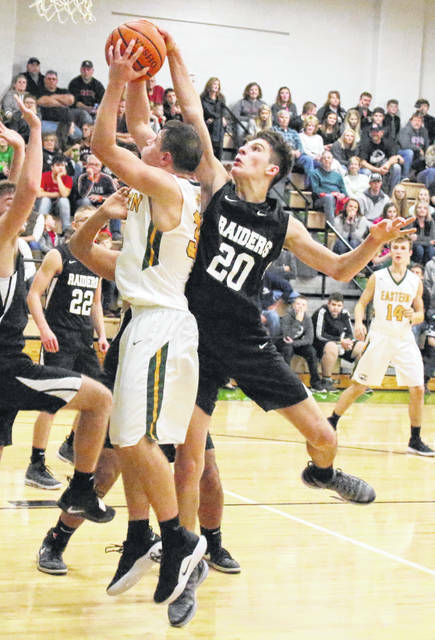 River Valley sophomore Jordan Lambert (20) blocks a shot attempt during a Nov. 30, 2018, boys basketball contest against Eastern in Tuppers Plains, Ohio. 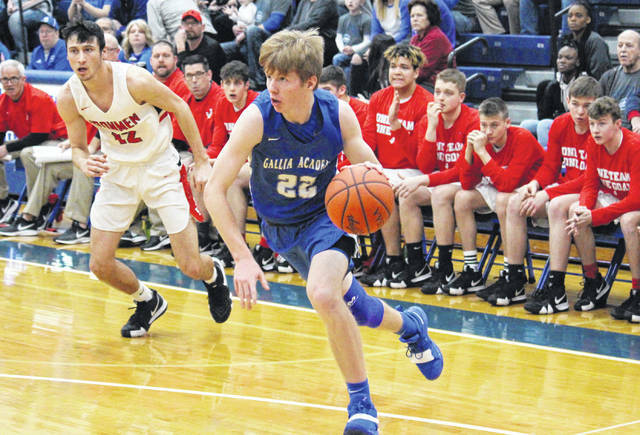 COLUMBUS, Ohio — The Ohio Prep Sportswriters Association has released the Division II All-Ohio boys basketball teams, featuring a pair of players from Gallia County. Both first time honorees on the All-Ohio basketball list, Gallia Academy senior Cory Call and River Valley sophomore Jordan Lambert both received honorable mention selections. Call led the 15-9 Blue Devils with 12.9 points per game, while Lambert paced the 3-20 Raiders with 15.1 points and 8.6 rebounds per contest. The Division II Player of the Year award went to Trotwood Madison senior Amari Davis, while the Coach of the Year award went to London’s Zach Brown. Morgan Safford, Columbus Hartley, 6-foot-4, sr., 25.6; Luka Eller, Mentor Lake Catholic, 6-7, jr., 27.1; C.J. Charleston, Gates Mills Gilmour Academy, 5-10, sr., 24.7; Chris Livingston, Akron Buchtel, 6-5, fr., 24.3; Cyler Kane-Johnson, Niles McKinley, 5-10, sr., 25.6; Amari Davis, Trotwood-Madison, 6-4, sr., 30.1; Brandon Hawaway, Norwalk, 6-2, sr., 20.5; Na’elle Simmons, Columbus Beechcroft, 6-7, sr., 15.3; Davin Zeigler, Cleveland Benedictine, 6-2, sr., 20.7; D’Arris Dean, Cincinnati Aiken, 6-0, sr., 21.9.